Sunday October 17th 1897 I got the work done in pretty good time and the folks came about eleven oclock. I went right on with the dinner. in the afternoon John & Callie with the little girls were up and Henrys family drove into the yard but did not stop. The folks went home about four oclock. read in evening. 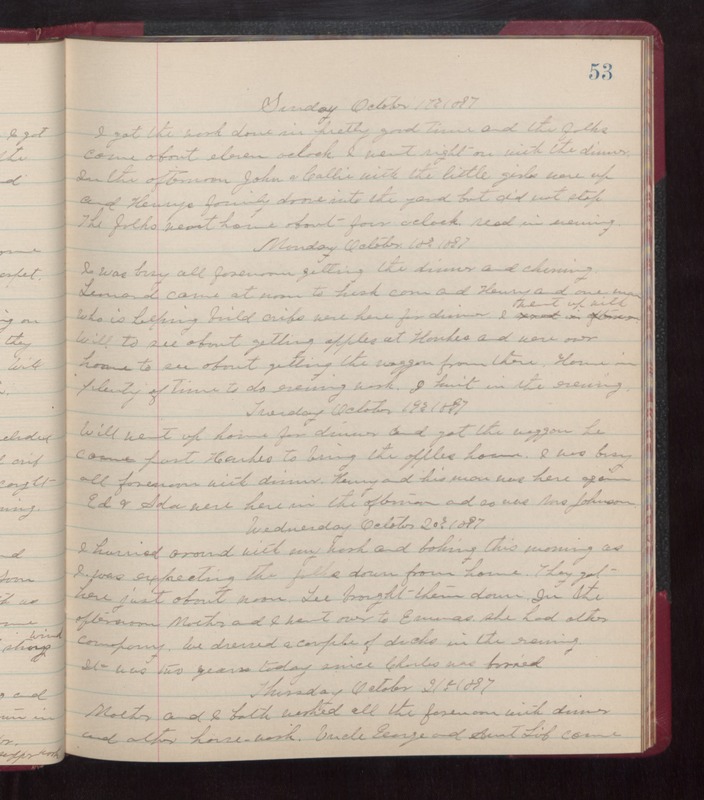 Monday October 10th 1897 I was busy all forenoon getting the dinner and cleaning. Leonard came at noon to husk corn and Henry and one man who is helping build cribs were here for dinner. I went up with Will to see about getting apples at Hankes and were over home to see about getting the waggon from there. Home in plenty of time to do evening work. I knit in the evening. Tuesday October 19th 1897 Will went up home for dinner and got the waggon. he came past Hankes to bring the apples home. I was busy all forenoon with dinner. Henry and his man was here again. Ed & Ada were here in the afternoon and so we Mrs Johnson. Wednesday October 20th 1897 I hurried around with my work and baking this morning as I was expecting the folks down from home. They got here jist about noon. Lee brought them down. In the afternoon Mother and I went over to Emmas. she had other company. We dressed a couple of ducks in the evening. It was two yards today since Charles was buried. Thursday October 21st 1897 Mother and I both worked all the forenoon with dinner and other house-work. Uncle George and Aunt Lib came.